Tenkai Zuifeng (瑞風　天堺, Zuifon Tenkai) is an apprentice barrier builder at the barrier shop, "Azumaterasu". They're also Tsurubami Senri's ally and the Extra Stage boss of Reactivate Majestical Imperial, as well as a playable character (and possible final boss) of Brilliant Pagoda or Haze Castle. 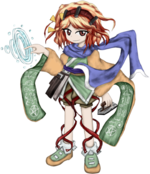 Tenkai comes from the Zuifeng clan, who are famed as barrier builders and even with being inexperienced and having a small number of notable achievements, they're known as a genius. When talking about work, their family is pretty known and has a lot of acquaintances from various families, including the priest Tsurubami Senri. At first, Tenkai might seem smug, overconfident and proud of their abilities as a barrier builder, but they're also very cunning and versatile. They've been best friends and partners with Tsurubami for a long time, and Tenkai holds Tsurubami in extremely high esteem. Now that Tsurubami is gone, Tenkai wants to restore Mugenri to its former state of order, explaining their distaste for the outsider humans. As a result of Tsurubami saving their life once, Tenkai cares for Tsurubami and helps them to resolve incidents around Mugenri, becoming their right-hand person. Unfortunately, Yabusame and Tsubakura find out that that treatment only extends to Tsurubami, since Tenkai has no interest in pledging loyalty to the Senri Shrine. They are also aware that despite being talented with barriers, their master and superiors put them to work hard on barrier repairing as training specifically to attack their prestige, rather than to help shore up their weaknesses (as the superiors explained it); this might explain why Tenkai prefers to hang around Mugenri. Tenkai also likes to dress in bright yellow and green clothing, leading most people to describe them as a "melon". While they like melons, they hate the nickname. Tenkai's ability is to produce barriers, which are typically shown as inverted areas in space. They use this ability to control and produce these barriers. One of the techniques they use is to create barriers that teleport things from inside it to another barrier, as shown in some of their nonspells when they teleport bullets from one barrier to another. Being the one who maintains the Mugenri Barrier, this ability is useful for repairing it. Tenkai has known Tsurubami since childhood because their families were acquaintances. The two were the original "heroes" of Mugenri and the two went often to do youkai extermination. However, Tsurubami went on vacations and planned to spirit away some humans from the Outside World who could replace them temporally. Tenkai opposed to letting some strangers in Mugenri, but Tsurubami did it anyway. Their full name is Tenkai Zuifeng (瑞風　天堺, Zuifon Tenkai). The kanji in their given name contains ten (天) that means "heaven" and kai (堺), an old-fashioned way to say "border". The kanji in their surname Zuifeng (瑞風) literally means "rising wind". The spelling that ends in "feng" is Chinese, where in Japanese it's pronounced as "Zuifon". 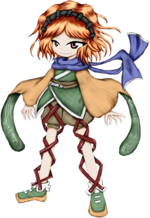 Tenkai is shown to have bright orange hair and eyes. They wear a black hairband and dresses in yellow and green traditional clothing, leading to being described as a melon. After a berserk Lumen Celeritas absorbed moonlight by accident during Earthen Miraculous Sword and attacked the Mugenri Barrier, it was weakened, so Tenkai's superiors tasked Tenkai to fix the barrier. Offended at doing such a minor task, Tenkai decided to disobey them and make a prank by creating a hole in the barrier. What they had no idea was that the soul-eater flower Harujion had just sprouted in Mugenri and it started to absorb spirits from the Outside World that came from the broken barrier. This resulted in the birth of the chimera soul Shion and a long winter in Mugenri. After Shion is defeated, Jinbei recognizes the hole in the barrier as Tenkai's doing, so the protagonists go to chastise them. Tenkai is eventually defeated and is shown to disapprove Tsurubami's decision to spirit away humans. After the fight, the barrier is repaired and Tenkai leaves, begrudgingly accepting Yabusame and Tsubakura as the new saviors of Mugenri. Tenkai is worried about the upcoming war between the Dragonfly Army and the Imperials. They go to warn Yabusame and Tsubakura about it, but the two were already gone. On the way to the shrine, Tenkai encounters Sukune Katano and Sese Kitsugai, who were plotting revenge on Yabusame and Tsubakura, and now they want Tenkai to help them. The barrier builder finds themself dragged by the two youkai around Mugenri, as they find out more about the war and what caused it. In all routes, it's revealed that Tsurubami and Tenkai were either feared, hated or respected due to being the dictators of Mugenri and their immense power. Tenkai starts to realize how much Tsurubami's decision to leave for the Outside World has affected Mugenri. At the end of the Brilliant Pagoda or Haze Castle routes, Tenkai is asked to be the new ruler, but Tenkai declines, saying that their loyalty lies with Tsurubami. In the end, they meet Suzumi Kuzu, the one responsible for the words about the "The mirror of Heaven shall split" in order to lure Tsubakura. Suzumi reveals their intention to make Tsubakura's life a living hell and after a hard fight, Suzumi erases their memories again (with Tenkai being the only one who vaguely remembers). Tenkai and Tsurubami had known each other since most of their life. Tsurubami helped them once after Tenkai had an accident with barriers. Afterwards, Tenkai became Tsurubami's most loyal ally and partner. After Tsurubami's long absence their rule has collapsed, so Tenkai wants to put Mugenri to its former order, since now youkai and the outsider humans are doing as they please. Tenkai holds Tsurubami in extremely high esteem and wants to protect Mugenri, in Tsurubami's behalf, but is annoyed by the priest's carefree attitude. The Zuifeng clan and the Senri Shrine had known each other for generations and Jinbei does know Tenkai. Apparently, Tenkai's fame as a barrier builder is widely known in Mugenri, so the social Sukune knows them and their powers. In Brilliant Pagoda or Haze Castle, it's revealed that Sukune and their peer group had the habit to nickname them the "Melon of Death" due to their clothing's color combined with their abilities. They seem to know each other and apparently Tenkai was aware of Saragimaru's plan to give Yaorochi the Tasouken. Saragimaru dislikes them because of their cunning personality. Tenkai disapproves of Tsurubami's decision to spirit away humans to Mugenri. Especially for those who cause trouble and contribute nothing to the safety of Mugenri, such as Kuroji. Tenkai doesn't really think Tsubakura is doing their job as a Senri Shrine priest, by being inclined towards doing things as they please instead of doing it the traditional way. When Tenkai meets Yabusame for the first time, Tenkai immediately understood that Tsurubami didn't let Yabusame to stay in Mugenri as shrine employee on a whim. In their eyes, if Tsubakura is Tsurubami's sucessor; then Yabusame is Tenkai's. Ironically, their friendships are very similar, both being a duo of close friends, with one being carefree and the other being more down-to-earth. Haiji is Tsurubami's biggest fan and idolizes them. They also seem to be jealous of Tenkai, who is Tsurubami's best friend. On their side, Tsurubami and Tenkai consider them a nuisance. While not confirmed, when asked about Tenkai's relationship with Clause, JynX dodged the question, implying a relationship between the two. They might be based on "Tenkai" (天海), a Japanese Tendai Buddhist monk of the Azuchi-Momoyama and early Edo periods, whose first Buddhist name was "Zuifū" (随風). Just like Tsurubami, Tenkai's sprite becomes black and white when moving, typically only in their movement onto the screen because they tend to be idle while fighting. According to JynX, the reason "風" in Tenkai's name is pronounced the Mandarin Chinese way, "feng", instead of the Japanese way, "fong", is because Tenkai is related to the Chinese Ideology of Yin-Yang and the Five Elements (陰陽五行思想). A possible connection is that "Wind" (風) is considered to be a part of "Wood" (木) in the Feng Shui (風水) and Chinese Medicine (中醫) branches of the ideology, as well as in some older iterations of it. Another possible connection is that barriers (結界) in Feng Shui utilises the ideology of the Five Elements to set up. This page was last edited on 17 February 2019, at 10:48.